Crates are another subject often mentioned and questioned. 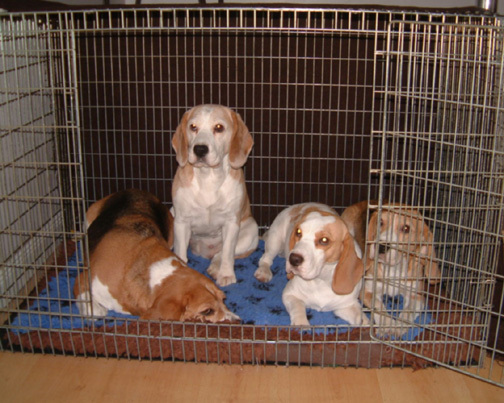 I had never used a crate before my involvement with beagles but wouldn’t be without one now. It’s useful for toilet training young ones and a safe place for puppy for short periods when he cannot be supervised. To my dogs it’s their retreat - their space. Mine sleep in their crate at night and go there voluntarily for a lie down or a snooze. It’s a good idea to have 3 sides covered to give your dog an added sense of security and to keep draughts off them at night. “How big?” I have often been asked. I would suggest a “standard” crate for a single beagle would be in the order of around 30” x 21” x 23” high. Crates also present a safe means of safely transporting your dog in the car so one with openings on the long and short side give you more flexibility. They should never be considered as a place to go for punishment or for enclosing a dog for long periods during your absence. This brings me to a question YOU are likely to be asked by a breeder from whom you are looking to buy a puppy - “is there someone at home most of the day?” Beagles crave company. Your family is their pack and to keep a beagle locked up in an empty house from 9-5 is a recipe for a miserable animal. If your home is empty for long spells at any time of the day please don’t think about owning a dog.